Hyundai i20 Coupé vs Seat Ibiza SC | What Car? Three-door superminis used to be just slightly cheaper, slightly less practical versions of their five-door siblings. However, car makers cottoned on to the sporty image that two fewer doors can bring, and with the help of clever styling tricks and a new name, although not necessarily more performance, the supermini ‘coupé’ was born. 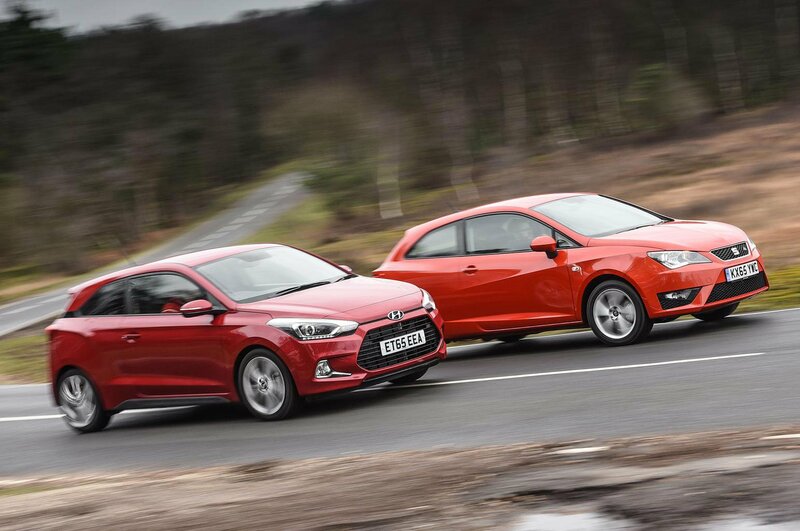 This brings us to the cars you see here: the Hyundai i20 Coupé and Seat Ibiza SC (short for Sport Coupé). Both are designed to add a little style and fun to a segment that usually focuses on economy and practicality but they must both still cut it in daily life. Each is available with a choice of engines, but we’ve gone for Hyundai’s new 118bhp three-cylinder petrol, while our chosen Seat gets a 1.2-litre four-cylinder motor with 108bhp. Both are small, turbocharged petrol engines that aim to combine economy with a zip of performance when you want it, and are paired with six-speed manual gearboxes. There’s a bit of turbo lag from both engines; it’s less obvious in the Seat, whereas the Hyundai can lurch forward a little when the extra power kicks in, even in normal driving. For such small engines, they pull respectably well from low revs, and offer good shove from just below 1500rpm all the way to the red line. The Ibiza is marginally quicker, but both take just over nine seconds to reach 60mph, which is usefully swift. They sound very different, though. The i20’s three-cylinder engine makes a low, fairly loud and aggressive noise when you accelerate; it’s fun for a while but can become wearing. The Ibiza’s four-cylinder unit is smoother and quieter but sounds higher-pitched. Both pipe down nicely when you’re cruising, even at high speed. With one eye on sportiness, both cars have fairly firm suspension, and this compromises ride quality somewhat. Lumps and bumps make the Seat bobble about in town, and the car fidgets around on coarse motorway surfaces. The Hyundai doesn’t ride particularly well, either, but at least its suspension goes about its business quietly, whereas occupants in the Seat have to suffer incessant thumps and bangs on any road that isn’t perfectly smooth. In fact, aside from its quieter engine, the Seat is less refined in all respects. There’s more wind noise, and rougher surfaces generate more road roar, despite the fact the Seat rides on smaller wheels than the Hyundai. However, the Ibiza gets our vote for fun. It gives you a greater sense of connection to the road, thanks to more feedback from the steering wheel, and it turns in to corners a bit more eagerly. Yes, the i20 grips better when cornering quickly and its body doesn’t roll as much, but it just feels a little numb and unexciting in comparison, and its power advantage is cancelled out by a slower engine response when you’re trying to accelerate between bends. The Hyundai’s steering wheel can wriggle in your hands through bumpy corners, too, while the Seat remains composed. The Ibiza also has better brake pedal feel and a more precise gearshift. You won’t find extravagance in either of the conservatively designed cabins. Not unusually for this class, soft-touch plastics are limited to the dashboard tops. While both interiors major on subdued black and grey finishes, the Ibiza’s is lifted a little by flashes of red stitching. Switchgear is generally well laid out and feels solid in both cars, but some plastic trim in the Seat feels quite flimsy. The Hyundai gets a front armrest with a cubby underneath and a cooled glovebox, neither of which are available in the Seat. The also comes with climate control as standard (it costs £320 to upgrade from air-conditioning in the Ibiza). However, unless you upgrade to range-topping Sport Nav trim (more on that later), the Hyundai’s infotainment system operates via a relatively crude monochrome central display, whereas the Seat provides a 5.0in colour touchscreen. Both front seats in the Ibiza are height-adjustable, but only the driver’s seat in the i20 moves up and down, and the Hyundai’s seat upholstery also feels comparatively cheap. It’s easy to find a comfortable seating position in either, but the Ibiza’s front seats are a little narrow around the shoulders and could use more under-thigh support. With two six-footers in the front, the i20’s rear seats are roomy enough for two more plus a smaller passenger in the middle seat; the same rear seat occupants will feel cramped in the Seat, especially when it comes to head room. Access to the rear seats isn’t overly tricky in either car. All-round visibility is worse in the Hyundai due to the small rear screen and chunkier windscreen. The Hyundai is more expensive to start with and costs £2575 more than the Seat after discounts. However, it is also better equipped: 17in alloys, climate control, rear parking sensors and a spacesaver spare wheel are fitted as standard, which together add £890 to the price of the Seat. However, both cars offer hill start-assist, 60:40 split-folding rear seats, cruise control, rain-sensing wipers, automatic headlights and Bluetooth, although only the Seat has a DAB radio. To add a sat-nav to the i20 you have to upgrade to Sport Nav trim. This costs an extra £675, and brings a 7.0in touchscreen, a DAB radio and a reversing camera. The Ibiza offers a £500 Technology Pack with sat-nav via a 6.5in touchscreen and smartphone integration for both Apple and Android devices. After three years of ownership, both cars will be worth around the same on the second-hand market. The Ibiza costs more to insure and to service, and our True MPG tests found it much less fuel efficient in real-world driving; it averaged 41.3mpg to the Hyundai’s 50.3mpg. However, the Seat is the cheaper option in the long run for cash buyers by around £800. Those taking out finance will get better value from Hyundai’s £1500 deposit contribution: put down a £2000 deposit and you’ll pay £249 per month over the next three years. With the same £2000 deposit (without any manufacturer contribution) the Ibiza costs £273 a month; even taking into account Seat’s offer of two years’ free servicing (worth about £400), that still works out as the poorer deal. Both finance agreements have an annual mileage limit of 10,000. Both cars have impressively low CO2 emissions. The Ibiza pumps out slightly more, which puts it in a higher band for company car tax, but the Seat’s lower list price makes up for this, so you’ll pay less slightly benefit-in-kind (BIK) tax over the first three years. The Ibiza is also cheaper to lease at £166 per month; the i20 will cost you an extra £31. The Seat scored five stars for safety from Euro NCAP, beating the i20’s four stars, but the Hyundai was tested under a newer, stricter system so the results aren’t comparable. The Seat has four airbags while the Hyundai gets six. It is also rated as more resistant to break-ins and theft by Thatcham. Not fussed about sleek styling and a fancy nametag? Then, frankly, there are better options than either of these wannabe coupés, including the class-leading Skoda Fabia and the Ford Fiesta, which is great to drive.However, if you’re willing to sacrifice some ability and value for a dash of extra charm the new i20 Coupé is well worth a look. It’s a pity it isn’t as fun to drive as the Ibiza, but it betters its Spanish rival in most other respects and works out cheaper if you’re buying on PCP finance.